It is usually held that representative government is not strictly democratic, since it does not allow the people themselves to directly make decisions. But here, taking as her guide Thomas Paine’s subversive view that “Athens, by representation, would have surpassed her own democracy,” Nadia Urbinati challenges this accepted wisdom, arguing that political representation deserves to be regarded as a fully legitimate mode of democratic decision making—and not just a pragmatic second choice when direct democracy is not possible. As Urbinati shows, the idea that representation is incompatible with democracy stems from our modern concept of sovereignty, which identifies politics with a decision maker’s direct physical presence and the immediate act of the will. She goes on to contend that a democratic theory of representation can and should go beyond these identifications. Political representation, she demonstrates, is ultimately grounded in a continuum of influence and power created by political judgment, as well as the way presence through ideas and speech links society with representative institutions. Deftly integrating the ideas of such thinkers as Rousseau, Kant, Emmanuel Joseph Sieyès, Paine, and the Marquis de Condorcet with her own, Urbinati constructs a thought-provoking alternative vision of democracy. Sovereign Unity: Symbiotic or Symbolic? "The work combines sound scholarship in the history of ideas with a convincing analytical approach. . . . A book that takes rightfully its place in a triptych next to the works of Hannah Pitkin and Bernard Manin." 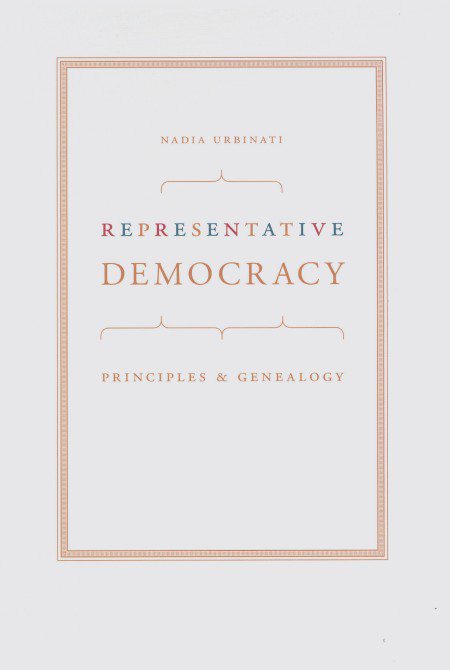 "In this clear, comprehensive, and compelling rehabilitation of representative democracy, Nadia Urbinati argues that, contrary to prevailing views, representation is not a ’defective substitute’ for direct democracy." "Urbinati provides an excellent and carefully researched overview of the historical origins of modern democratic thought. This is recommended reading for anyone interested in the origins and functions of democratic representation and makes the book worthwhile reading even apart from Urbinati’s own contribution to contemporary democratic theory. At the same time this historical analysis grounds an analytically rigorous theory of modern representative democracy that is significant in its own right."